Teachers can paint: Art Source 2015 | Oh, the Places We See . . . Located in the UT Downtown Gallery, this show opened on Knoxville’s First Friday to a packed house. Yes, teachers can paint. And sculpt. And put together interesting collages. And all the while help little kids who spill paint, can’t think of anything to draw, and would not like to clean up even though the bell is about to ring. Want to see what teachers can do in the quiet of their own homes and studios? 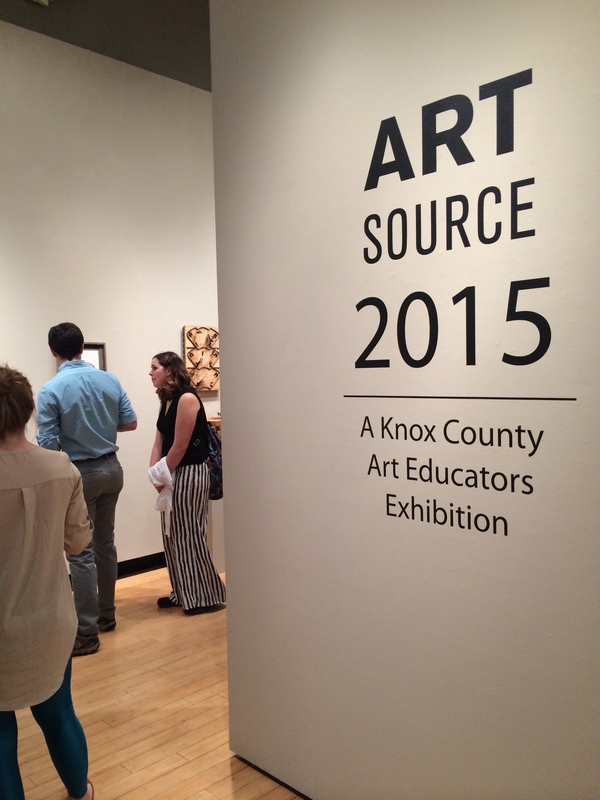 Then you need to visit Art Source 2015: A Knox County Art Educators Exhibition located in the UT Downtown Gallery. A large crowd, some who had also been to First Friday at the Emporium’s Regional Fine Arts Exhibition, gathered at this gallery next door to enjoy the creativity of these busy art educators. Rush Hour Traffic by Carolina Blanks of Fountain City Elementary. Just One of Those Days by Cheryl Burchett, Beaumont Elementary. Loveless Lovelace by Hannah Mae Barker, Powell High. We’re not ones to pick a favorite, but the face of this lady in Right Now?!? by Jessica Stewart reminds us of some familiar moments. What about you? The UT Downtown Gallery is located at 100 S. Gay Street, Knoxville, TN 37902. This entry was posted in Travel and tagged art, art educators, Art Source 2015, Dogwood Arts Festival 2015, sculpture, UT Downtown Gallery. Bookmark the permalink. Thank you for featuring the work of Knox County Art Educators. 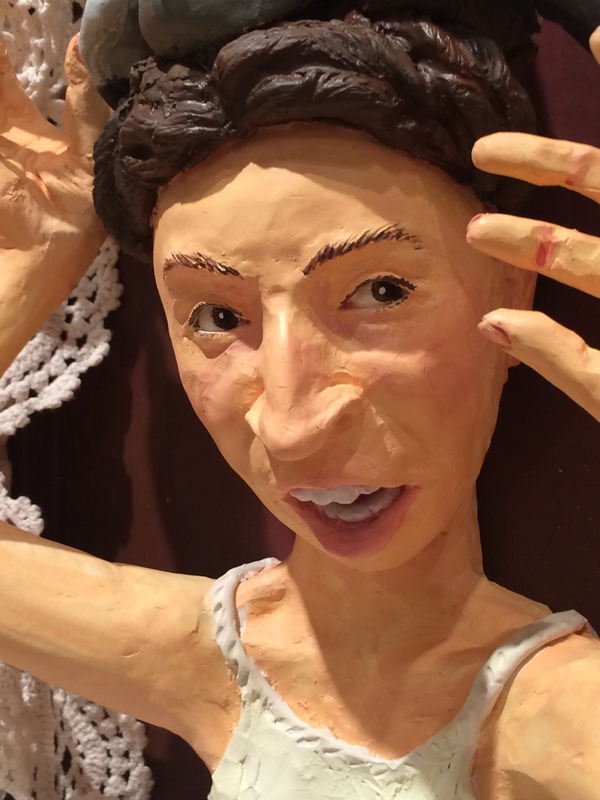 I supervise the Visual Arts Department, and I was so pleased to see this blog post. Our teachers work tirelessly all year and make the time to create and show their own artwork. This is critical to being an effective art teacher, and I’m proud to know and work with each one of them. Thank you for your support. My pleasure, Heather. We were so very pleased to see the quality and variety in the work this year. Honestly, I have no idea how teachers have time to produce such great work. Thanks for your note. And I hope lots of people attend the show! Thanks for taking a look at these art pieces. I included One of the Those Days again because it, too, was one of my favorites from the show. Appreciate your comment! You are so right, Curt. And how these folks have time for art with all their other responsibilities is beyond me. No doubt some of the artists for Burning Man are in the public schools helping kids learn the value of art. Or at least I hope so. Some outstanding works here. I love the ‘Rush Hour Traffic’ painting. Thanks for taking a look. I love that watery technique of Rush Hour Traffic also.